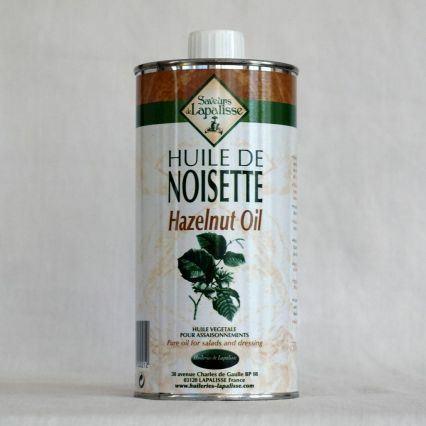 Hazelnut oil by Saveurs de Lapalisse has a light and pleasant nutty flavour and is delicious to drizzle over mixed salads or brush a little on grilled fish and steaks. Hazelnut oil also works well in salads and stir fries and avocado. Storage: Can be stored in a kitchen cupboard for up to a year, even once opened. Dietary Information: Suitable for vegetarians and vegans. Gluten free. Lactose free. Nut free. Egg free. Wheat and derivative free. A simple way to enjoy hazelnut oil as a salad dressing is to mix 50ml walnut oil, 1 tablespoon good quality balsamic vinegar, a teaspoon of dijon mustard and a sprinkling of salt and pour this over any salad.